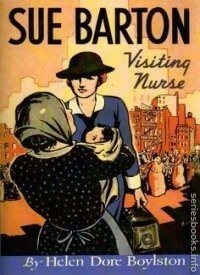 Sue Barton is the heroine in this series of seven nursing novels written by Helen Dore Boylston (1895-1984), between 1936 and 1952. Originally published by Little, Brown & Co, it had many reprints by other publishers both foreign and domestic following its initial publication. The series currently is in reprint by Image Cascade Publishing. 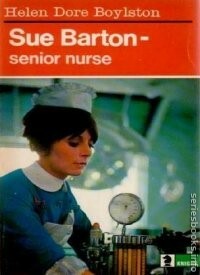 The series follows Sue Barton through her nursing training and her work and personal life. 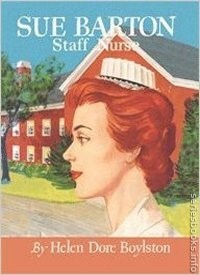 In a publisher's note in a 1967 British edition of the book, Boylston stated that all the nursing incidents in the first two books were based on real events. The Kit, Connie and Bill characters were also based on real individuals and used their real names, while others used pseudonyms. She denied that Barton herself was an autobiographical portrait, saying "I made her up, lock, stock and barrel. 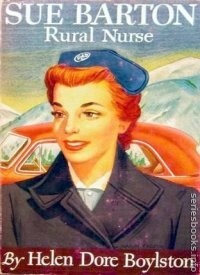 She is the kind of person and the kind of nurse I wished I were, and I had a lot of fun creating her." 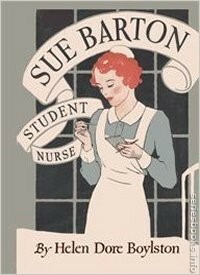 Sue begins training as a student nurse. 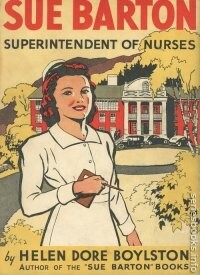 She meets her friends Kit and Connie in this book and also her husband-to-be, Dr Bill Barry. Sue manages to have a number of adventures as she trains, including falling down a laundry shaft and saving a feverish patient from jumping out of a window while recovering from appendix surgery. Sue finishes her training, which includes psychiatric nursing and obstetrics. 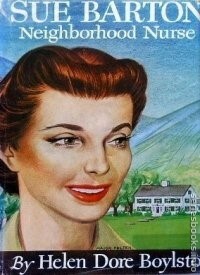 She also becomes engaged to Bill at the end of this book. Sue and her friend Kit go to New York City to join the Henry Street Settlement Nurses, created by Lillian Wald. Connie gets married in this book and Bill pressures Sue to marry him. Sue refuses, wanting a chance to repay the training she received from the Settlement Houses. At one point, Sue helps an elderly patient fulfill her dream of travel by using the money for her wedding clothes. Sue leaves the Visiting Nurses and returns home, only to find that a tragic accident has left Bill with the care of a disabled brother. He cannot marry Sue until things are settled. Sue sets herself up as a visiting rural nurse in the town of Springfield, New Hampshire and winds up in the middle of a typhoid outbreak. Sue finally marries Bill, then works as the head of the nursing school at the new hospital in Springfield. However, her marriage to Bill is not smooth sailing and Sue questions her ability to provide a proper nursing training for her students. Sue suffers regrets about leaving her nursing career while she cares for her three children, each of whom has particular needs. She also helps a young teenager, Cal, to be more sociable and Cal's mother, the artist Mona Stuart, to be kinder. Sue realises that her role in her family and the wider neighborhood is also important. Sue returns to work to support her children while her husband is in a sanatorium suffering from tuberculosis. He eventually recovers and the family is reunited once more, with the implication that Sue will return to her position as wife and mother.